The island of Ischia is among the most famous spa, sea and tourist locations in Italy and the world. Thanks to its natural beauty, its picturesque landscape, splendid beaches and the aromas and flavours of its produce, the Island of Ischia offers guests a wide range of "experiences": from spa tourism to pure fun, from excursions in the green woodland to the discovery of roads and ancient districts, all the way to shopping among the thousands of little shops on the main street. With its 18 miles of beach, bays and inlets and lush vegetation behind an uncontaminated landscape, Ischia has been called the Garden of Europe. The typical mediterranean cuisine is another attraction of the island of Ischia. Vegetables, such as tomatoes, aubergines, artichokes and salads are the showcase of the island. Those which grow in a sunnier areas are excellent. Dried tomatoes are especially flavoursome, they are preserved in extra virgin olive oil and spiced with hot chilli pepper and natural flavours. Also the production of wine is excellent. Ischia wines are easily recognised thanks to their aromas: oregano, rosemary, broom, wild fennel, herbs found in Campania that influence the aroma of these wines giving them organolectic characteristics typical of this region. Limoncello is a speciality from the island, a liqueur produced following antique recipes with lemon rinds left to soak in alcohol and sugar. FUN 2010 will be held at the Hotel Continental Terme. Special rates for rooms are available for participants. In order to take advantage of this reservation you have to send the reservation form directly to the hotel. 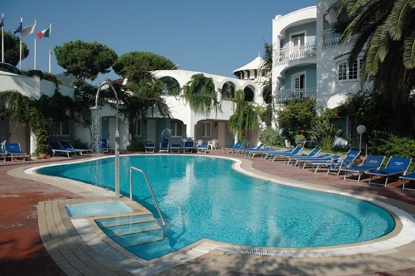 Since ischia is a popular vacation resort, we suggest to book your hotel as soon as possible. A few cheaper rooms are available for students; participants must contact directly the Hotel for any information.